This is my first addon, i know there is a lot of improvement to do, i was planning some future updates if i get good feedback from the users, i made this addon because i want to be able to sit at a park, then having a stranger sit next to me, and have a friendly chess match, maybe even bet gold, or just make good friends/rivals thanks to this extraordinary game called chess, keep in mind that this addon wont prevent you from doing illegal movements (not yet! ), so play with trustworthy friends, and dont forget to have fun! You may wish to look at libGroupSocket as a tool to send moves between players, without needing to go through chat. I wouldn't bother personally. Many other active data addons use libgroupsocket already and that's a lot of extra data you'll have to parse out. Last edited by Drummerx04 : 08/19/18 at 09:24 AM. I love the concept behind this add-on as it brings another unique twist to the add-on library. Great work! Hopefully feedback will inspire you to keep adding to this one -- and maybe even inspire others to also create fun stuff like this. "Detect checkmates/stalemates and defile the winner." I THINK you may have meant define the winner, but hey, they do things differently in Tamriel. 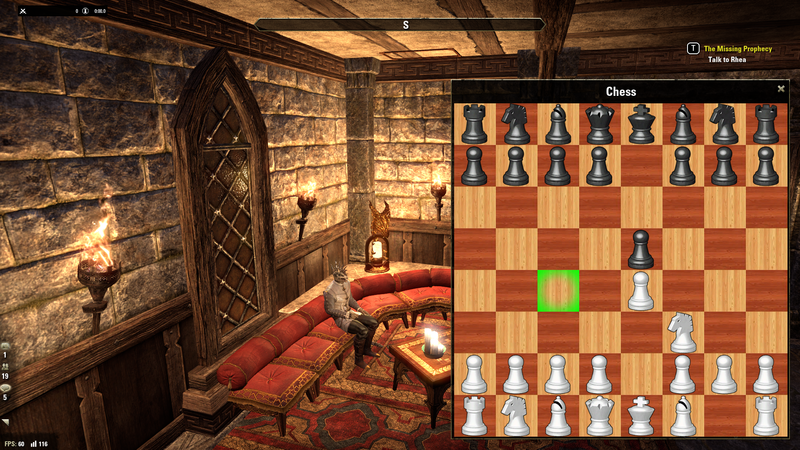 I like chess, but why use bandwidth (and a potential person slot in the ESO game) for another game in the game?? That's just a waste and selfish. The 90'ies called, they want their attitude back. Dude. It's OK to not like things, but don't be mean about things you don't like! Last edited by Drako-Ei : 08/04/18 at 04:59 AM. Yup! It is an amazing, horrible hack, but ... I guess it goes to show that no matter what you do, people will find unintended side channel hacks to work around it. OTOH, that same description could apply to this! Seriously, though, I think it is cool you build this.